Extra Judicial Killing: European Union expressed deep concern over the extra-judicial killings in Bangladesh. European Union expressed deep concern over the extra-judicial killings in Bangladesh. By Bangladesh Media: The European Union yesterday expressed deep concern over the recent incidents of abduction, murder, disappearance and extra-judicial killing in Bangladesh, and called for bringing the culprits to justice through proper investigations. EU Ambassador William Hanna said the community had voiced concern in recent weeks over extra-judicial killings and harassment of human rights defenders. He was also worried about the conditions of minority communities, full implementation of the Chittagong Hill Tracts peace accord and the human rights of Rohingya refugees. Expressing concern at the recent disappearance of British national Mujibur Rahman Mujib in Sunamganj, Nick Low, acting High Commissioner of the UK, demanded that the government apprise them of the circumstances of his disappearance and the progress in the probe. He urged the authorities concerned to do whatever was necessary to find Mujib and his driver. Human rights are at the heart of the relationship between the EU and Bangladesh, he said. Nick Low also called upon the authorities to take steps for Ilias Ali's safe return to his family, and clarify the circumstances of the BNP leader's disappearance two years ago. Echoing his view, Hanna said there was a need for proper probe in every case no matter whether the person is a citizen of the UK or Bangladesh. “Justice is very important,” he said. The EU envoy said all cases of abductions and killings should be properly investigated and justice should be done. Universal values of democracy and respect for human rights are the fundamentals of the cooperation agreement. The EU also renewed its stand on the need for a dialogue between the major political parties to resolve current problems before going for a fresh national election. Hanna said the EU made clear its position by a number of statements, including the one in December last year when it decided not to send observers to the January 5 polls, and another on January 9. The EU sticks to its January 9 statement that said the Bangladeshi people were not given an opportunity to express fully their democratic choice in the January 5 national elections, said the EU ambassador. In the statement, the EU urged all parties to refrain from violence and engage in genuine dialogue to find a way towards a transparent, inclusive and credible election. On labour issues, Hanna said substantial progress in that area is important for Bangladesh to continue its preferential access to the EU market, not only for RMG products but also for all the goods it exports to the EU market. All need to work together to ensure that the commitments made by stakeholders last year are met and that the Rana Plaza victims are fully compensated, he added. Danish Ambassador Hanne Fugl Eskaer laid stress on the role of civil society and the media in raising the voice on human rights issues. French Ambassador Michel Trinquier, German Ambassador Albrecht Conze, Spanish Ambassador Luis Tejada Chacon, Dutch Ambassador Gerben Sjoerd de Jong, Charge d'Affaires of Sweden Karin Rohlin and Charge d'Affaires of Italy Edmondo Falconi were also present at the press conference. 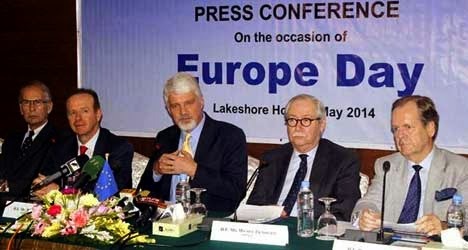 EU delegates in Dhaka were speaking at a press conference at the city's Hotel Lake Shore on the occasion of Europe Day.